Occasionally I manage to salvage more quality out of a day that I expect to. In general, my 'battery' feels acutely drained, but it was soothing to get out this afternoon with Francis to the new Tinderbox cafe where our friend, Krista, has opened a small shop at the back of the cafe. It sells artsy things and has sofas and halogen lighting and a piano. The air smells of ground coffee and new things. It was good to sip tea, eat cake and gaze at stuff. Gazing at stuff is a useful analgesic for me, with a half life of about hour. I'm happy to be home now to the autumny smells of fireworks outside and warm radiators inside. 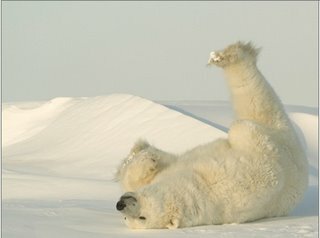 And David Attenborough's Planet Earth will be on TV later with world class polar bear footage. Cheers Dave. PS. I got borderline weepy when the male polar bear died due to lack of food. I'd be happy to sacrifice an aesthetically-challenged walrus without tears. Shame on me and my animal cuteness hierarchy.
. . . is there a new tinderbox cafe?! had no idea . . . I had that polar bear moment too last night! At first I was all with the mother walrus protecting her baby but then I totally switched my sympathies at the mention that this was polar's last chance of survival. His lying down in the snow in surrender to exhaustion/hunger was so ME-like it hurt. new Tinderbox on Ingram St in Merchant city. It's fancy!